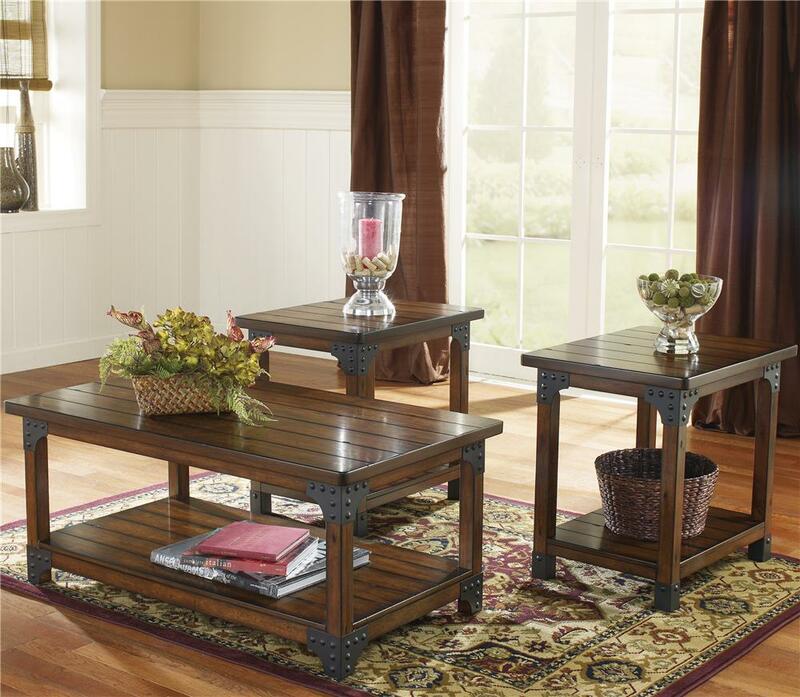 Accentuate your favorite living room furniture with the rustic style of the 3-in-1 occasional table group. One rectangular cocktail table and two end tables feature nail details, bronze colored metal and a medium brown wood finish with a chiseled effect. The Murphy Traditional 1 Cocktail Table and 2 End Table Pack by Signature Design by Ashley at Sam Levitz Furniture in the Tucson, Oro Valley, Marana, Vail, and Green Valley, AZ area. Product availability may vary. Contact us for the most current availability on this product. The rich finish and unique rustic design of the Murphy accent table collection creates a warm inviting furniture collection sure to enhance the look and feel of any living room. The rich style of the burnished medium brown wood finish features a chiseled effect that adds to the rustic beauty of these tables to create a relaxed environment perfect for any home. 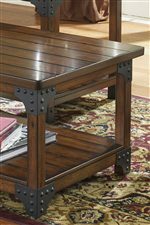 With the deep bronze color finish of the metal brackets adorned with nail head detailing, this accent table collection fits comfortably into the decor of any living area. Create a home to be proud of with the warm rustic design of the Murphy accent table collection. The Murphy collection is a great option if you are looking for Industrial Traditional furniture in the Tucson, Oro Valley, Marana, Vail, and Green Valley, AZ area.